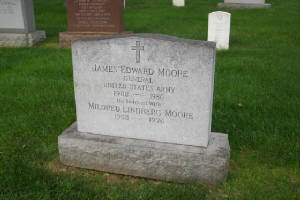 James Edward Moore was a United States four Star general. He was born November 1902 in New Bedford, Massachusetts and died January 28, 1986. During his life he not only served a long period of his life in duty for America during both World War 2 and the Cold War, but he also had a family. June 19, 1926 he got married to Mildred Lindberg and got three children; Patricia, James Jr. and Mary. 1920 – 1930: James Edward Moore was a student at the U.S. Military Academy where he graduated as number 7375. When he graduated he started working his way up by starting as a second lieutenant serving with 5th Infantry Regiment, and in the end of the 30s (1929 – 1932), he served with 10th infantry regiment. 1930 – 1940:He was a student in Infantry school 1932 – 1933 and 1933 – 1936 he was a Personnel and Assistant Adjutant at the 15th Infantry Regiment in China. Later he was a student at the Command and General Staff School, and in the end of the 40s he was a Company Commander at the 29th Infantry Regiment. 1940 – 1950:In the beginning of the 40s he served with Headquarters with the 2nd Infantry Division. He later on was Chief Of Staff for different Infantry Divisions, and later (1945 – 1946), he was Chief of Staff of the Ninth US. Army. 1947 – 1948 he was Commanding General for the South Sector in the Pacific US. Army and 1948 – 1950 he was Secretary of the Army General Staff. 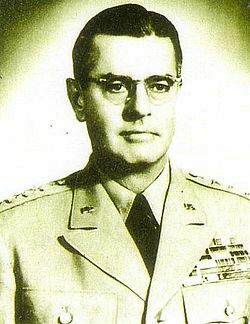 1950 – 1960:One highlight of the 50s for Moore was 1955 – 1958 when he worked as a U.S. High Commissioner at Ryukyes Islands and Commanding General for IX Corps. Later on (1958 – 1959) he was Deputy Army Chief of Staff for Military Operations. After this impressive long journey he was Chief of Staff for SHAPE (Supreme Headquarters Allied Powers Europe), and 1963 he retired. He received a service medal – the Legion of Merit (Three) – Bronze star medal. He died 1986 and was buried in Section 30 of Arlington National Cemetery. James Edward Moore went through lots of different events throughout his career. One of his main events was 1945, when he was the Chief of Staff of the U.S. Ninth Army with a troop of 200 000 soldiers. He worked for Lieutenant General William H. Simpson, who led this army under the overall leadership of Dwight D. Eisenhower (General of the US. Army, and later on the 34th president of United States).Moore was a very organized and communicative person. He was famous for his meetings with his staff where he discussed important issues like the different decisions staff officers had made during the day, instead of just routine matters. Moore also kept a good communication with Simpson regarding updates of key staff matters. He seems to have been more of an administrator than a direct soldier. Another important event in James E. Moore career was as a commanding general at the Ryukyu Islands. During the last month of WW2 U.S. forces used the island Okinawa as a base for air attacks on Japan and as an area for a planned invasion of Japanese home islands. Although also after the War America continued using Okinawa to maintain security of the Far East. 1952, after America had ended the occupation of Okinawa, it was still run by a U.S. military government.